A super flavorful sheet pan dinner that is easy-to-make and ready in 30 minutes! It can even be made ahead for easy weekly meal prep. 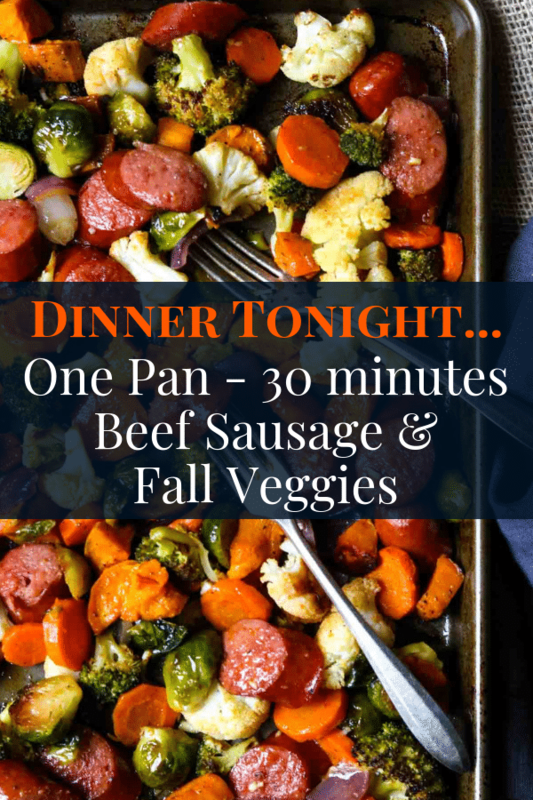 This one pan dinner is full of all the fall colors and flavors that you want in your comfort food this time of year. 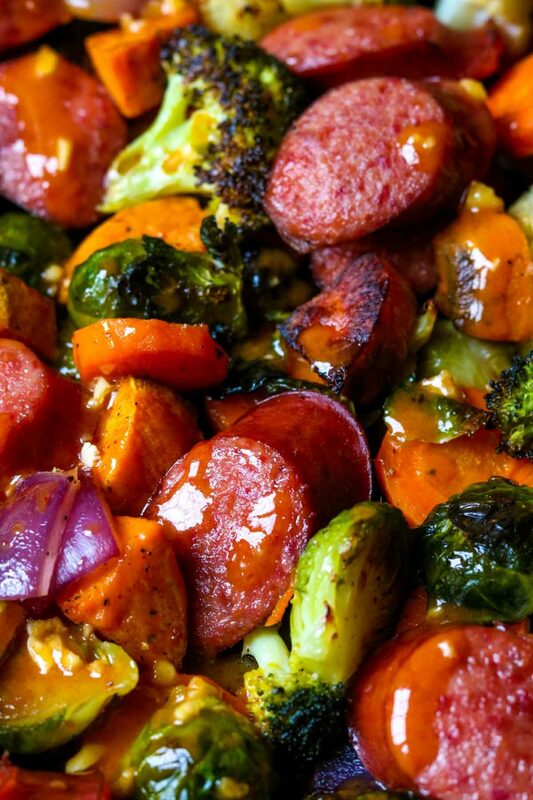 The smoked beef sausage is warmed thru and the fresh veggies are roasted and perfectly caramelized. When the sheet pan dinner is pulled hot from the oven you drizzle on a smoked paprika vinaigrette that adds another delicious layer of flavor. 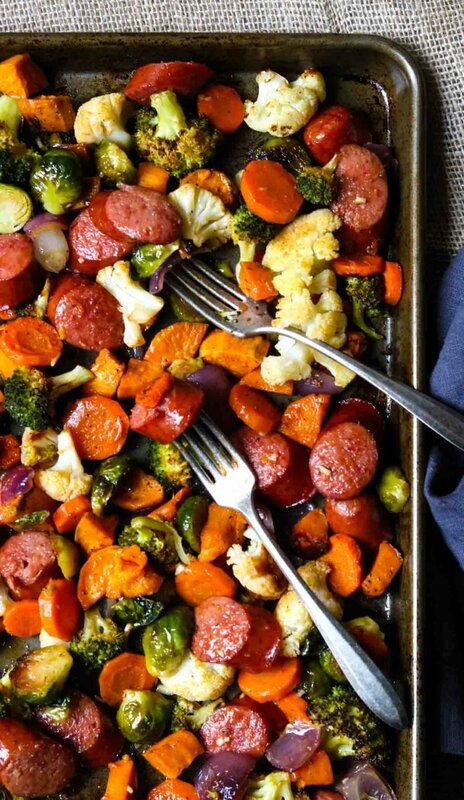 It compliments the fall veggies and smoked beef sausage perfectly. You need to get on board with the sheet pan dinner trend, asap! You can have your entire dinner made in one pan, in the oven, all cooked together, and these recipes are usually done in 30 minutes or less! Not only is this an incredibly easy way to get dinner on the table… it leaves very little clean-up after the fact. PIN THIS SHEET PAN DINNER RECIPE HERE! Grab a large sheet pan and preheat your oven to 400 degrees. 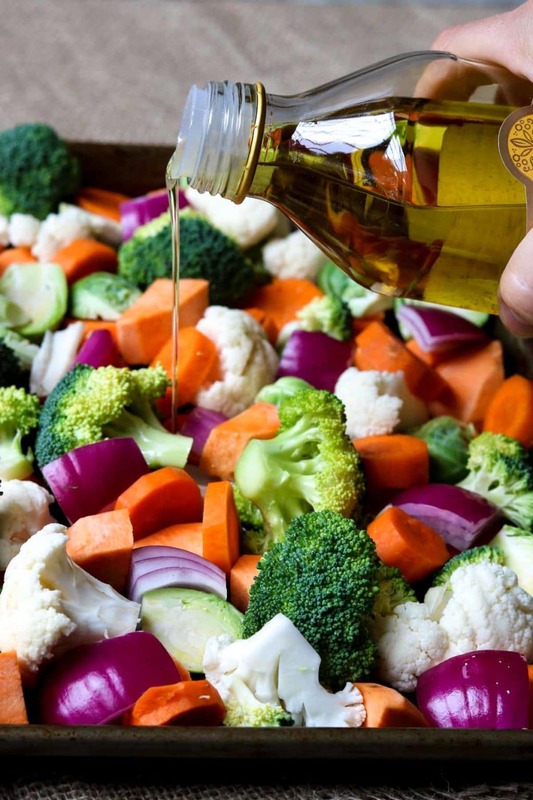 Put all the vegetables on the sheet pan and drizzle with the olive oil and sprinkle with salt and pepper. Toss everything around with clean hands so it is all coated with oil. Pop that into the preheated oven for 15 minutes. Meanwhile cut the sausage link into about 20 pieces. Pull the sheet pan of veggies from the oven, they will be about half way cooked. Give them a good toss with a spatula and then add the sausage to the pan, right on top of the vegetables. Put it back in the oven for an additional 12 minutes. This will warm the sausage thru and start to caramelize the veggies. Put the lid on the jar and shake it vigorously, until all the ingredients are emulsified together. If you do not have mason jars (read: go get some) use a bowl and whisk. Once you pull the sheet pan out the oven, drizzle the vinaigrette over the veggies and beef. Give it a toss with a spatula to distribute the vinaigrette and it’s time to eat. If you know that you are going to have a really busy week, this is a great dinner to prep and have in the fridge for later! 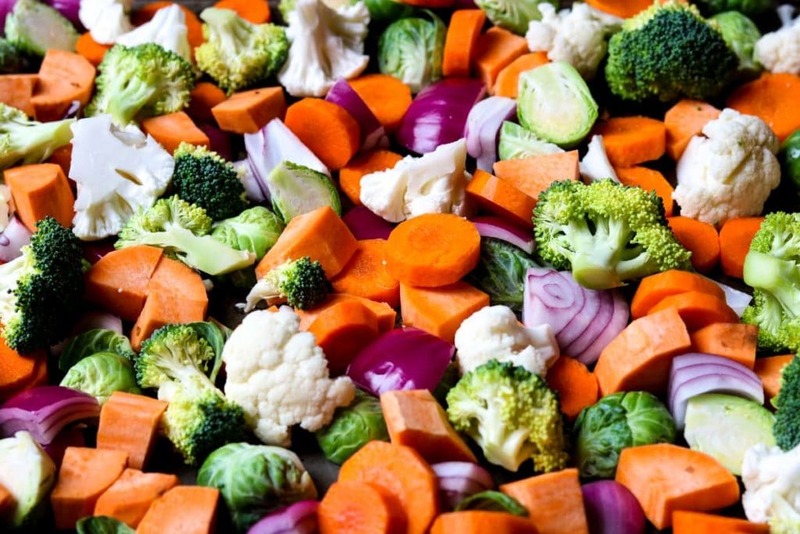 Simply cut all the veggies and place them in an airtight container for up to 2 days. 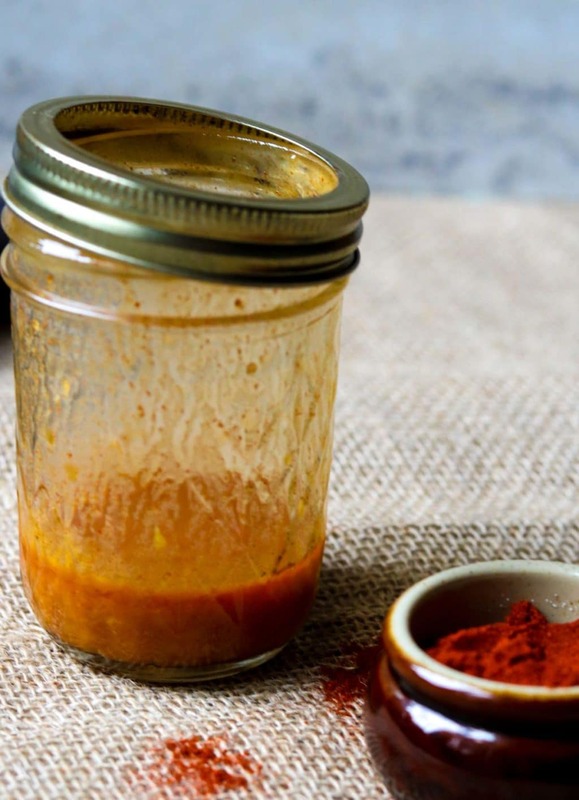 You can also prep the vinaigrette in a mason jar and keep it in the fridge. When it is time for dinner, just follow the baking instructions and dinner will be ready in under 30 minutes! If you make this and love it as much as I do, let me know! Share a picture on Instagram and tag me @momsdinnerinsta or on Facebook and tag me @mom’sdinner. 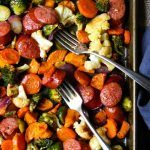 I hope you give this recipe for Healthy Sheet Pan Sausage & Veggies with Smoked Paprika Vinaigrette a try in your kitchen! Save this Sheet Pan Dinner recipe for later. Pin it here. A super flavorful sheet pan dinner that is easy to make and is ready in under 30 minutes. 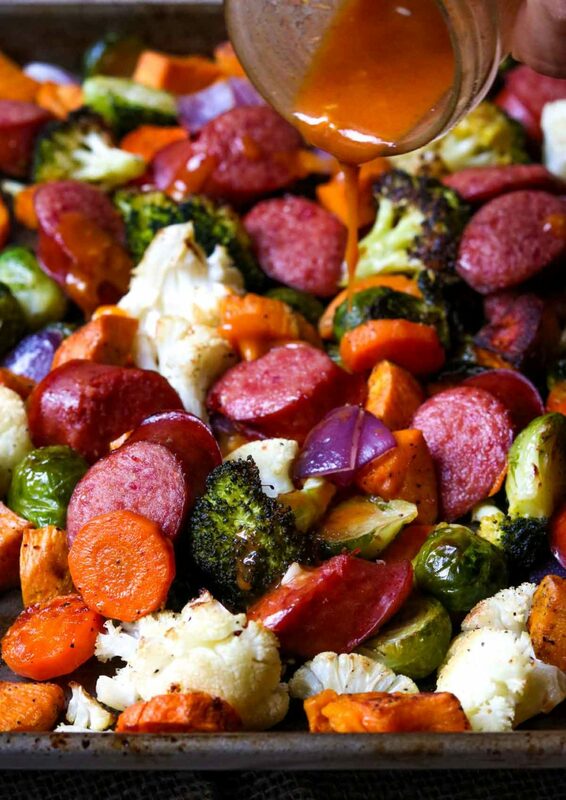 All the veggies get caramelized and the smoked beef sausage get warmed thru perfectly. This sheet pan dinner is finished with a drizzle of delicious smoked paprika vinaigrette. This makes a great weeknight meal and can even be prepped ahead for a busy night! Prep all the veggies and place on a large sheet pan. With clean hands toss the veggies in the olive oil and sprinkle with salt and pepper. Meanwhile cut the sausage link into 20 pieces. Toss the veggies with a spatula. Then place the sausage pieces over the cooked veggies. Place back in the oven for an additional 12 minutes. screw the lid on tightly and shake vigorously until all the ingredients are emulsified. 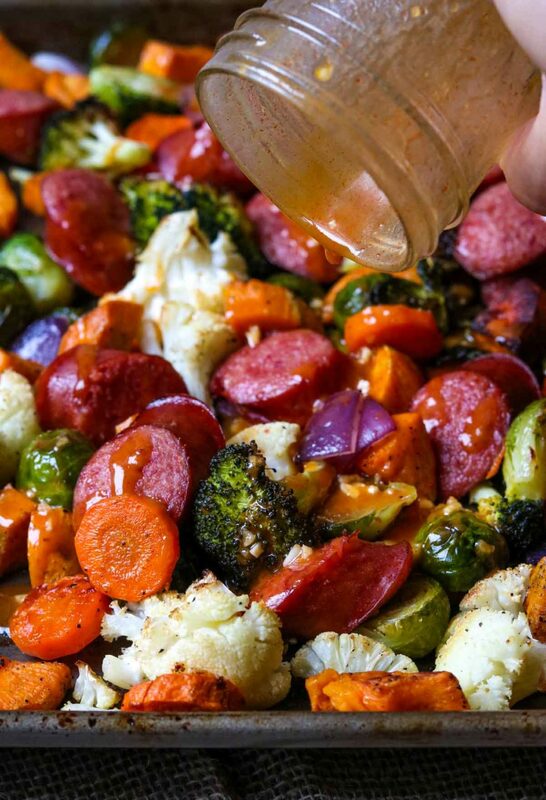 Pull the sheet pan out of the oven and drizzle the vinaigrette over the veggies and sausage. Toss to coat. Peel and cut all the veggies and place in an airtight container, in the fridge, for up to 2 days. Make the vinaigrette and store in the fridge. Follow the cooking directions when you are ready to make this for dinner. Flavor packed!! True Confession – I ate the majority of the food on the sheet pan and then licked the pan clean. It’s that good! Well, since I wasn’t home I didn’t witness that. But, Ill believe it… it’s that good!